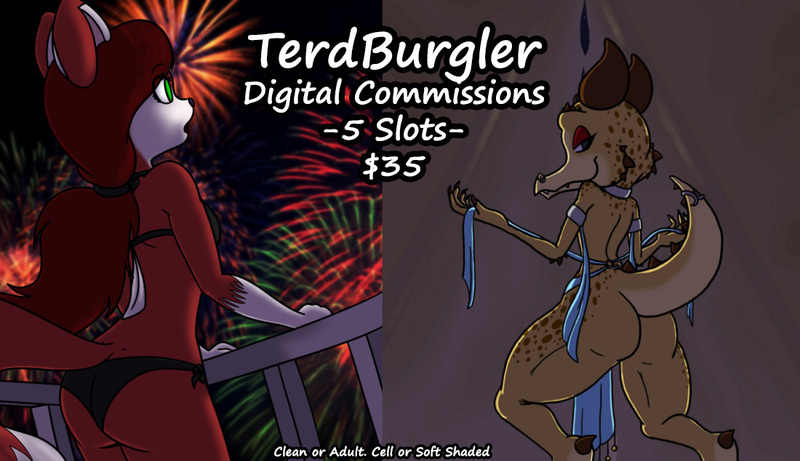 That's right, I just cleaned out my commission queue so it's time to open up some more slots! These are digital, colored, full-body pics with two-tone shading. They can be clean or dirty and include a simple background. Additional characters are $20 each. Characters with complex patterns, wings or extra appendages are subject to an additional charge based on the design. If you'd like to pick up a slot, you need to SEND ME A NOTE with a link to a character reference, what you'd like them to wear (or not wear), a single sentence to describe the setting and a single word to describe the mood. If you don't follow these rules, you won't get a slot. I'll be responding to the notes to let you know if you got the slot and follow up with all the details after that.